Bites for Babies – Spicing up baby’s meals one recipe at a time. le petite rêve – all in a day, from culinary to crafty creations. Endless Adventure International – More than just kayaking. Englishman in Italy – An Englishman, his Sicilian wife and an Italian / English Dictionary. 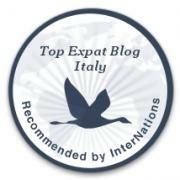 Expats in Italy – for those who dream and those who live the dream. Italian Reflections – for travellers, settlers and expats alike. Italy Chronicles – The Italy you don’t know – in English! Married to Italy – Big city Texan girl meets small town Italian boy. SardegnaBlog – The most popular read blog in all of Sardinia. Orizzonte Casa Sardegna – A delightful English-speaking agent with over 15 years’ experience working, living and selling in Sardinia, Italy. Paradisola – A complete guide to everything Sardinia. Tharros Sardinia – A complete database of bronze age nuraghe. Fare i turisti a Oristano – Blog. Bagni di Lucca and Beyond is not there! I will go and check out your other friends.